Seriously, when I saw this I thought it was photoshoped. Then I read the article and was like maybe that is real. Then I was like nah, no way that's real, has to be photoshopped. Then I looked at the enlarged version and I realized that it really was real. but omfg, how does something like this even happen? I really would like to know how ground can just drop into what appears to be nothingness. 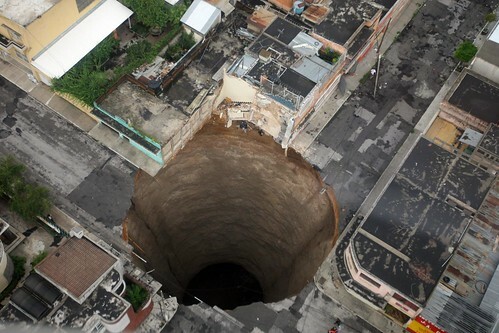 The hole is over 60m deep and swallowed 12 homes and a 3 story building when it collapsed. My first thought was Silver Surfer, but I quickly disregarded that. My second though was that the city was built over an old mine or large well/pit or something similar. But whatever the reason it looks very weird. It's clearly a sign that someone out there tried, and failed to develop a death star. . . And they really don't like Earth. Awesome pic, I got that in an e-mail somewhere.